I’m excited to announce that I have been appointed to the Energy and Commerce (E&C) Committee for the 116th Congress. As a member of the subcommittees on Health, Energy, and Oversight and Investigations, I will fight for New Hampshire priorities such as increasing access to affordable healthcare, combating climate change, promoting renewable energy, addressing the opioid epidemic, and pushing back against efforts by President Trump and Congressional Republicans to sabotage the Affordable Care Act and gut environmental protections. 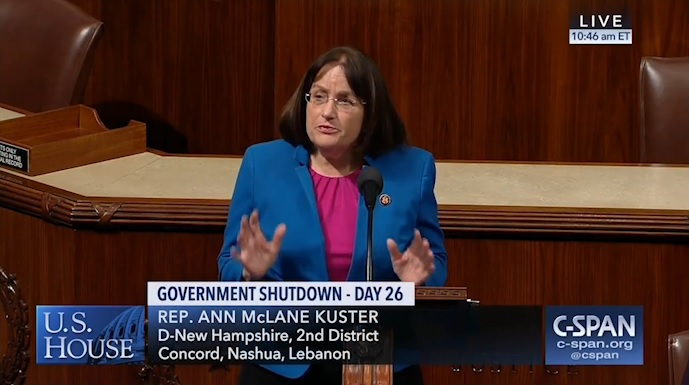 On Wednesday, I took to the House floor and shared stories I’ve heard from Granite Staters who are facing real hardship because of President Trump’s irresponsible shutdown. One woman wrote to me and said, “My two girls and I count on the auto deposit from their dad. If this goes on, we will not be able to buy food, pay bills, or buy gasoline.” Another Granite Stater, who is a correctional officer and serves in the National Guard, wrote to me, saying: “As the sole provider of a family with four children, this affects me unjustly. Although I would prefer to stay, I cannot continue to support my family with no pay, and I will leave Federal Service if this continues.” Although Republicans and Democrats agree that we need comprehensive immigration reform that includes 21st century border security, this cannot be achieved while President Trump holds government employees hostage for his ineffective border wall. It’s time President Trump reopened the government so that we can focus on the hard work expected of us by the American people. Speaking on the House Floor about the Impact of the Shutdown. Watch here. I was pleased to join Planned Parenthood President Dr. Leana Wen and my House Democratic colleagues on Tuesday to reinforce our commitment to protecting Planned Parenthood and the rights of women to make their own reproductive health choices. President Trump’s attacks on reproductive rights and reproductive health services will hurt women and their families. I will continue fighting to help ensure women are in charge of their reproductive health. 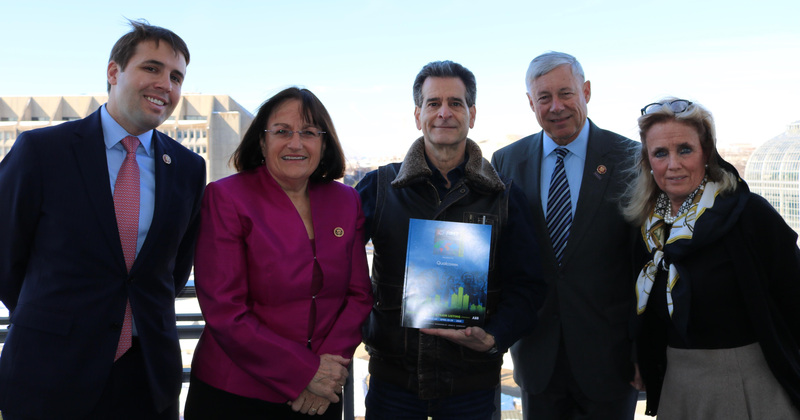 On Tuesday, I was excited to join Representatives Chris Pappas, Fred Upton and Debbie Dingell, as well as Dean Kamen, inventor of Segway and founder of For Inspiration and Recognition of Science and Technology (FIRST), in support of a commemorative coin honoring the life and legacy of Christa McAuliffe. Christa’s passion for science and exploration continues to inspire students in New Hampshire and across the country, and this coin will benefit FIRST and encourage young people to pursue STEM education and careers in the 21st century. I worked with Representatives Marcy Kaptur (OH-09) and Donald Norcross (NJ-01) in leading more than 60 of our colleagues incalling on Speaker of the House Nancy Pelosi and Majority Leader Steny Hoyer to prioritize policies that will help tackle the opioid epidemic. A recent report by the Centers for Disease Control and Prevention found a dramatic increase in deaths nationally due to synthetic opioids such as fentanyl and increases in overdose deaths in many of the hardest hit states. In the 116th Congress, I’m committed to advancing policies that will save lives and rebuild communities. It’s imperative that Speaker Pelosi and Leader Hoyer prioritize this issue and empower the new Congress to take additional action to address the opioid epidemic. Last week, I co-introduced H.R. 299, the Blue Water Navy Vietnam Veterans Act of 2019, which would expand veterans benefits for 90,000 Navy veterans who served in the coastal waters of Vietnam and are impacted by toxic exposure as a result of their service. The failure to properly care for these veterans is an affront to all our men and women in uniform and veterans. We must deliver on our promise to ensure that those who have sacrificed in the defense of our freedoms receive the healthcare and services they deserve when they return home. I’m proud to introduce legislation to right this wrong and I’ll continue to fight to ensure that all our servicemembers receive the benefits they have earned. I remain grateful for everything you do to make New Hampshire such a great place to live, work, and raise a family. Please do not hesitate to call my Washington, DC office at 202-225-5206 or my Concord office at 603-226-1002 with any questions, concerns or ideas you may have. I love hearing from you! Thank you again for all your contributions, and I hope you enjoy your weekend.